Competitive Smash Bros. Melee’s Joseph “Mango” Marquez the night the birds edged out Chicago. 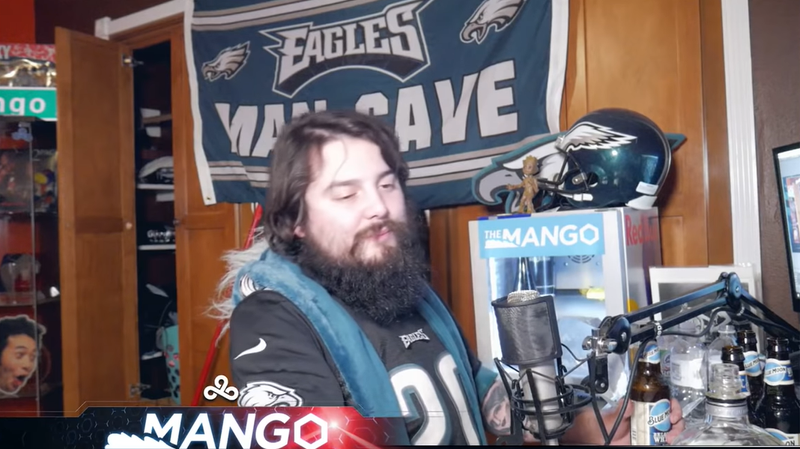 Joseph “Mango” Marquez, one of the “five gods” of Super Smash Bros. Melee, is on an unpaid vacation this week after Twitch banned his channel for allegedly drinking too much during a weekend stream and passing out. Marquez shared the news on his Twitter account, tweeting out a screenshot of the email from Twitch letting him know why his channel was down. “Based on a review of your activity or content, we have issued a Community Guidelines strike on your account,” the email read in part. It cited “Dangerous consumption of drugs or alcohol” as the reason he was hit with a week-long suspension. The incident in question occurred while Marquez was streaming Sunday night after watching the Philadelphia Eagles’ unexpected (and thrilling to me, personally) win over the Chicago Bears. It was a wild first-round play off game that ended 16-15 only after Bears kicker Cody Parkey missed a field goal attempt well within his maximum range in the final seconds of the game. Not only did he miss the field goal, but the ball struck the left upright and the cross bar before bouncing backwards onto the field. And only after Eagles’ coach Doug Pederson used the team’s last time out a split second before Parkey’s first attempt, which turned out to be good, to force a redo. Marquez has still been playing Smash Bros. Ultimate, just not with anyone able to watch.